This white short sleeve t-shirt has the Pat Foster driven, Barry Setzer Vega on the front. This vintage design was made to depict the Drag Race shirts of that time. 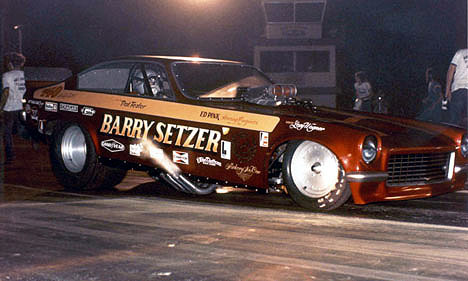 Great vintage look of one of the most iconic funny cars of all Time. As always be assured of the fact that you are purchasing Guaranteed Authentic Salinas Boys apparel. In the early ’70s this was the baddest funny car out there. The infamous Barry Setzer Vega with Pat Foster at the throttle ruled the funny car world at the time. Shown here at Englishtown, Foster was not only the driver but the crew chief and for a while this car was unbeatable. This white short sleeve t-shirt has the Pat Foster driven, Barry Setzer Vega on the front. This funny car driven By Cole’s dad, Pat Foster was FAST!! The vintage design was made to depict the Drag Race shirts of that time. Great vintage look of one of the most iconic funny cars of all time. As always be assured of the fact that you are purchasing Guaranteed Authentic Salinas Boys apparel. Salinas Boyz – Automoto / Live Hard. Ride Hard. Stay Hard.